Apache Flume is a top-level project at the Apache Software Foundation. There are currently two release code lines available, versions 0.9.x and 1.x. This documentation applies to the 1.x codeline. For the 0.9.x codeline, please see the Flume 0.9.x Developer Guide. An Event is a unit of data that flows through a Flume agent. 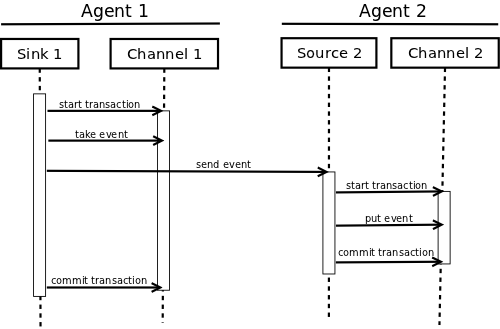 The Event flows from Source to Channel to Sink, and is represented by an implementation of the Event interface. An Event carries a payload (byte array) that is accompanied by an optional set of headers (string attributes). A Flume agent is a process (JVM) that hosts the components that allow Events to flow from an external source to a external destination. A Source consumes Events having a specific format, and those Events are delivered to the Source by an external source like a web server. For example, an AvroSource can be used to receive Avro Events from clients or from other Flume agents in the flow. When a Source receives an Event, it stores it into one or more Channels. The Channel is a passive store that holds the Event until that Event is consumed by a Sink. One type of Channel available in Flume is the FileChannel which uses the local filesystem as its backing store. A Sink is responsible for removing an Event from the Channel and putting it into an external repository like HDFS (in the case of an HDFSEventSink) or forwarding it to the Source at the next hop of the flow. The Source and Sink within the given agent run asynchronously with the Events staged in the Channel. An Event is staged in a Flume agent’s Channel. Then it’s the Sink‘s responsibility to deliver the Event to the next agent or terminal repository (like HDFS) in the flow. The Sink removes an Event from the Channel only after the Event is stored into the Channel of the next agent or stored in the terminal repository. This is how the single-hop message delivery semantics in Flume provide end-to-end reliability of the flow. Flume uses a transactional approach to guarantee the reliable delivery of the Events. The Sources and Sinks encapsulate the storage/retrieval of the Events in a Transaction provided by the Channel. This ensures that the set of Events are reliably passed from point to point in the flow. In the case of a multi-hop flow, the Sink from the previous hop and the Source of the next hop both have their Transactions open to ensure that the Event data is safely stored in the Channel of the next hop. Check-out the code using Git. Click here for the git repository root. Please note that Flume builds requires that the Google Protocol Buffers compiler be in the path. You can download and install it by following the instructions here. File channel has a dependency on Protocol Buffer. When updating the version of Protocol Buffer used by Flume, it is necessary to regenerate the data access classes using the protoc compiler that is part of Protocol Buffer as follows. The client operates at the point of origin of events and delivers them to a Flume agent. Clients typically operate in the process space of the application they are consuming data from. Flume currently supports Avro, log4j, syslog, and Http POST (with a JSON body) as ways to transfer data from a external source. Additionally, there’s an ExecSource that can consume the output of a local process as input to Flume. It’s quite possible to have a use case where these existing options are not sufficient. In this case you can build a custom mechanism to send data to Flume. There are two ways of achieving this. The first option is to create a custom client that communicates with one of Flume’s existing Sources like AvroSource or SyslogTcpSource. Here the client should convert its data into messages understood by these Flume Sources. The other option is to write a custom Flume Source that directly talks with your existing client application using some IPC or RPC protocol, and then converts the client data into Flume Events to be sent downstream. Note that all events stored within the Channel of a Flume agent must exist as Flume Events. Though Flume contains a number of built-in mechanisms (i.e. Sources) to ingest data, often one wants the ability to communicate with Flume directly from a custom application. The Flume Client SDK is a library that enables applications to connect to Flume and send data into Flume’s data flow over RPC. An implementation of Flume’s RpcClient interface encapsulates the RPC mechanism supported by Flume. The user’s application can simply call the Flume Client SDK’s append(Event) or appendBatch(List<Event>) to send data and not worry about the underlying message exchange details. The user can provide the required Event arg by either directly implementing the Event interface, by using a convenience implementation such as the SimpleEvent class, or by using EventBuilder‘s overloaded withBody() static helper methods. # For using a thrift source set the following instead of the above line. # degenerate into just a default client. The Flume Client SDK also supports an RpcClient which load-balances among multiple hosts. This type of client takes a whitespace-separated list of <host>:<port> representing the Flume agents that make-up a load-balancing group. This client can be configured with a load balancing strategy that either randomly selects one of the configured hosts, or selects a host in a round-robin fashion. You can also specify your own custom class that implements the LoadBalancingRpcClient$HostSelector interface so that a custom selection order is used. In that case, the FQCN of the custom class needs to be specified as the value of the host-selector property. The LoadBalancing RPC Client currently does not support thrift. If backoff is enabled then the client will temporarily blacklist hosts that fail, causing them to be excluded from being selected as a failover host until a given timeout. When the timeout elapses, if the host is still unresponsive then this is considered a sequential failure, and the timeout is increased exponentially to avoid potentially getting stuck in long waits on unresponsive hosts. props.put("backoff", "true"); // Disabled by default. # Other values are include "random"
Flume has an embedded agent api which allows users to embed an agent in their application. This agent is meant to be lightweight and as such not all sources, sinks, and channels are allowed. Specifically the source used is a special embedded source and events should be send to the source via the put, putAll methods on the EmbeddedAgent object. Only File Channel and Memory Channel are allowed as channels while Avro Sink is the only supported sink. Interceptors are also supported by the embedded agent. Note: The embedded agent has a dependency on hadoop-core.jar. source.type embedded The only available source is the embedded source. channel.type – Either memory or file which correspond to MemoryChannel and FileChannel respectively. channel. * – Configuration options for the channel type requested, see MemoryChannel or FileChannel user guide for an exhaustive list. sink. * – Configuration options for the sink. See AvroSink user guide for an exhaustive list, however note AvroSink requires at least hostname and port. processor.type – Either failover or load_balance which correspond to FailoverSinksProcessor and LoadBalancingSinkProcessor respectively. processor. * – Configuration options for the sink processor selected. See FailoverSinksProcessor and LoadBalancingSinkProcessor user guide for an exhaustive list. The Transaction interface is the basis of reliability for Flume. All the major components (ie. Sources, Sinks and Channels) must use a Flume Transaction. Here we get hold of a Transaction from a Channel. After begin() returns, the Transaction is now active/open and the Event is then put into the Channel. If the put is successful, then the Transaction is committed and closed. The purpose of a Source is to receive data from an external client and store it into the configured Channels. A Source can get an instance of its own ChannelProcessor to process an Event, commited within a Channel local transaction, in serial. In the case of an exception, required Channels will propagate the exception, all Channels will rollback their transaction, but events processed previously on other Channels will remain committed. Similar to the SinkRunner.PollingRunner Runnable, there’s a PollingRunner Runnable that executes on a thread created when the Flume framework calls PollableSourceRunner.start(). Each configured PollableSource is associated with its own thread that runs a PollingRunner. This thread manages the PollableSource’s lifecycle, such as starting and stopping. A PollableSource implementation must implement the start() and stop() methods that are declared in the LifecycleAware interface. The runner of a PollableSource invokes that Source‘s process() method. The process() method should check for new data and store it into the Channel as Flume Events.